Did Duke Get Another Free Pass? DURHAM, North Carolina - I've written about this before. In fact, many sports journalists have as well. Despite those articles, and many peoples' questions, there have never been any answers from the NCAA or Duke University about the Lance Thomas/Jewelry Scandal that made headlines last September. 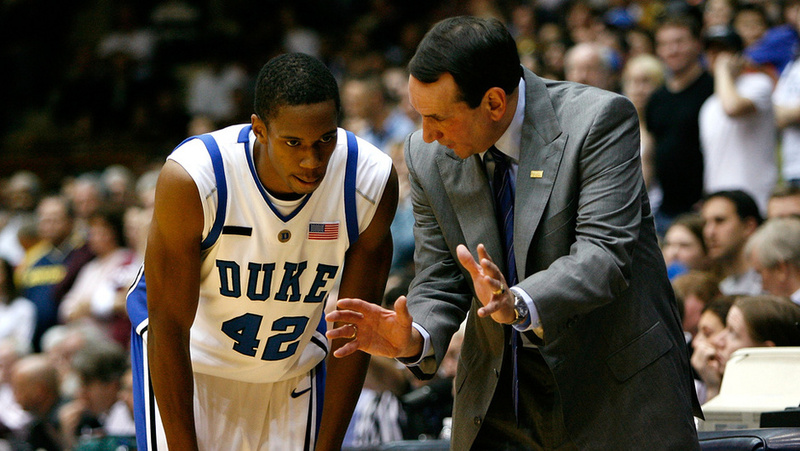 Just a refresher on the facts for those who may have forgotten: in December 2009, Lance Thomas, then a senior on Duke's men's basketball team, walked into Thomas and Rafaello & Co. Jewelers in Manhattan and purchased $97,800 worth of jewelry. Thomas put down $30,000 in cash and received $67,800 worth of credit from the jewelry store on his purchase. He was to return in a few weeks and pay off the balance. Now many questions pop into your mind when you read that, most notably, (1) where did a college senior come up with $30,000 in cash and (2) why did a reputable jeweler, with clients such as Carmelo Anthony, extend almost $70K worth of credit to a 22-year old college kid? We never received those answers and, we never will. Why? Because the NCAA has seemingly turned a blind eye to the situation, and the Duke-obsessed college hoops media has let it slip under the rug quietly. If this was Michael Kidd-Gilchrist, Coach Calipari and Kentucky, would it have gone away so easily? I doubt it. What about Shabazz Muhammad, Ben Howland and UCLA? Strongly doubt that as well. But this was not UK or UCLA, this was Duke, the NCAA's "Golden Child" of college hoops. They can't let something like this destroy the image of perfection that is Coach K's program, right? Right. ​FREE PASS ON LANCE THOMAS? Now, if you recall, Duke and Thomas won the national championship in 2010, just four months after Mr. Thomas made his enormous purchase. That would mean if the NCAA were to properly investigate this situation, and if it were found that Lance Thomas received improper benefits based upon his high profile athletic status, that would be an NCAA violation and Thomas would retroactively be ruled ineligible for the 2nd half of Duke's 2009-2010 season. Duke would then forfeit every game that Thomas played in while ineligible, including their 61-59 win over Butler in the title game. Yes, that means Duke's 2010 National Championship would be vacated. Oh. My. God. And that, my friends, is exactly why the NCAA has essentially overlooked the entire situation, citing both the jeweler's and Thomas' failure to cooperate. Huh? Failure to cooperate? Since when has that stopped the NCAA from investigating? Of course they are not cooperating. Why would they? How about trying to speak to some people that would cooperate? Or maybe conducting some type of investigation? While it truly is somewhat unbelievable, it is not at all unprecedented when it comes to Duke basketball. Let me take you back to 1998-1999. That season Duke had a star freshman forward named Corey Maggette, a 6'6" SF from Oak Park, Illinois. Also that season, Duke went 37-2, losing in the National Championship game to UConn. Maggette played in all 39 games that year, averaging 10.6 ppg in 17.7 mins per contest. Following the season, Duke had four 1st Round NBA draft picks, including Maggette at No.13 to the Seattle Supersonics. Less than a year later, however, after Maggette already left Duke for the League, his former AAU coach, Myron Piggie, was indicted and later plead guilty to a conspiracy charge, accused of paying high school basketball players improperly and defrauding Duke and three other universities. Piggie subsequently admitted to paying Maggette and four other players (UCLA's JaRon Rush, Missouri's Kareem Rush, NBA draft pick Korleone Young and Oklahoma St.'s Andre Williams) more than $35,000, from 1996-1998, while each was in high school and played for his Kansas City-based AAU team. Following the indictment, and prior to the guilty plea, Maggette retracted earlier denials and admitted to accepting $2,000 from Piggie while in high school. Duke responded by saying they were unaware of the payments accepted by Maggette before he entered Duke. But Duke's knowledge of the situation should not have mattered, right? It's strict liability, right? Maggette, having admitted to accepting the money, which was from a pool of funds that had contributions from at least two agents, was ineligible, right? So, Duke used an ineligible player in 39 games, 37 of those victories, and those wins should be vacated, right? Along with the ACC regular season title, the ACC tournament title and the Final Four birth, right? Apparently not. No immediate investigation of Duke followed and the victories were never vacated, nor were the banners removed from Cameron Indoor Stadium. Weird. It sure is weird. And what makes it so weird is that there have been other instances where players committed NCAA infractions, were retroactively ruled ineligible, and victories were vacated and banners were stripped. Chris Webber and Michigan, ring a bell? It was found that Webber, while at Michigan, accepted improper benefits. Accordingly, Webber was an ineligible player and both of Michigan's 1992 & 1993 Final Four banners were removed. How about Derrick Rose and Memphis? There, the NCAA found, after Rose left for the NBA, that his SAT score was fraudulent and that he was ineligible to play for Memphis during the 2007-2008 season, a season where Memphis went 38-2 and reached the national title game. Result? Victories vacated and Final Four banner removed a mere 16 months after Rose left campus. And it was never found or mentioned that Coach John Calipari or the University of Memphis knew, or should have known, that Rose's SAT score was fraudulent and that the Tigers were using an ineligible player. It didn't matter. The NCAA cited strict liability. "Play each player at your own risk." Okay then, I'll ask again, what's the deal with Duke? What is it about Coach K and the Blue Devils that allows them to skate investigations and charges so easily? And not only in the Maggette situation, but now with the Lance Thomas debacle. Selective enforcement needs to stop. I know, I know. I get it. Christian Laettner. Bobby Hurley. Grant Hill. JJ Redick. Thomas Hill. Squeaky clean. Coach K. That's great. But those players are long gone. And apparently, so is the squeaky cleanliness. It's time to stop backing down from the almighty Coach K. There are obvious improprieties going on. They go on everywhere, trust me. There are no perfect programs. And that includes Duke. If the NCAA wants to enact by-laws that state that "athletes can not receive improper benefits because of their athletic status," then they need to enforce the rule across the board, not just against those programs that the NCAA dislikes. Before last season, there was an utter witch-hunt over Shabazz Muhammad and UCLA. And ultimately, the NCAA had to drop the case when one of their agent's boyfriends was overheard on a plane talking about how the NCAA is "gonna get" Muhammad, Coach Howland and the Bruins. But Lance Thomas and Duke, with a civil suit filed and plenty of outright facts available, gets a shrug of the shoulders. And the college hoops media is, quite frankly, just as guilty right now. Why haven't they questioned the NCAA or Duke thoroughly? Why are they just letting this go so easily when there is far more than mere speculation here? One time and you can chalk it up to a little favoritism, but this is twice now. And in between these two incidents there have been multiple other NCAA investigations, suspensions, vacations and firings at other schools for not only similar, but lesser, offenses. So I ask you NCAA, and I ask you Duke, what gives?